In the year 1919 Bob Ray Gilbert and Emil Marcy, farmers, neighbors, and friends, who live along the Red River in an area west of Burkburnett, Texas, are faced with a decision which will change their lives and the lives of several of their friends who join with them in their quest to protect their farms and mineral resources from the madness all around them as the oil boom surrounds their farms, … and a city of 10,000 springs up almost overnight at the south end of a mile long toll bridge over the Red River which becomes known as Bridgetown. This is their story, and it has an unusual twist when Emil Marcy tells the group a secret told to him many years before by his famous cousin, Captain Randolph B. Marcy, U.S.A., who led the Expedition of 1852 to find the head waters of the Red River in order to establish the boundary line set forth in the Treaty of 1819 between the United States and Spain. Oil like gold brings out the worst and the best in men. We will see some of both as this story unfolds. 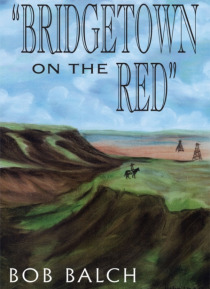 Hopefully, the reader will be both educated and entertained as the oil boom at Bridgetown on the Red comes to life in the pages of this book. World War I has ended and thousands of doughboys converge on the area looking for jobs in the oil boom. Millionaires are made over night as gusher wells burst forth their black gold from within the earth. Greed, dishonesty, and fraud always accompany money, and there is plenty to go around in Bridgetown. How will Bob Ray Gilbert and Emil Marcy fare in this fast paced new world which their farms and lives become thrust into overnight? If you read the book, you will feel good at the end because truth and honesty win out over larceny and greed. As echoed by Bob Ray Gilbert at the end, God Bless America.